Via YouTube comes this exceptionally rare video of Elvis (1) showing off his humor while trying to tie the LARGEST tie of all time and (2) receiving two gold records from RCA for Elvis’ Madison Square Garden album and for the 45 single “words” which was written by one of the Bee Gees. Courtesy of YouTube comes an interesting list of the “girlfriends of Elvis”. Please share this post, this blog, http://www.ElvisCollector.info (the premier Elvis Presley website with rare content), http://www.ElvisCollectorWorldwide.freeforums.org (100% free Elvis Presley fan forum and we invite you to become a member). 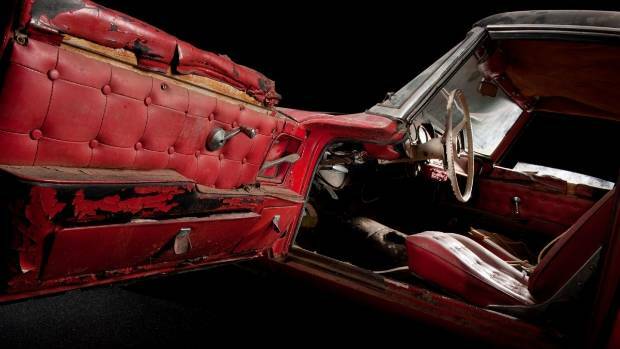 Check out this dilapidated BMW 507 that was once owned by Elvis Presley. 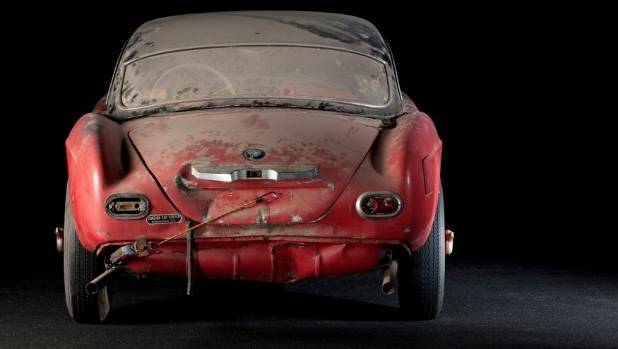 The car, found in a barn in the US, was put on display in Germany in 2014 prior to undergoing a two-year restoration. Two years ago it was a case of “now or never” for the restoration of a decrepit classic once owned by the King of Rock ‘n’ Roll, Elvis Presley. The BMW 507, considered by many to be one of the most beautiful roadsters ever made, had been found rusting away in a barn near San Francisco in 2014. BMW’s Classic Group stepped in and have completed an amazing ground-up restoration with the result of their work to be unveiled publicly for the first time on August 21 at the Pebble Beach Concours d’Elegance in the US. Elvis Presley in front of a BMW 507. It was March 1958 when Presley – who died August 16, 1977 – fell in love with the 1957 BMW 507 roadster. 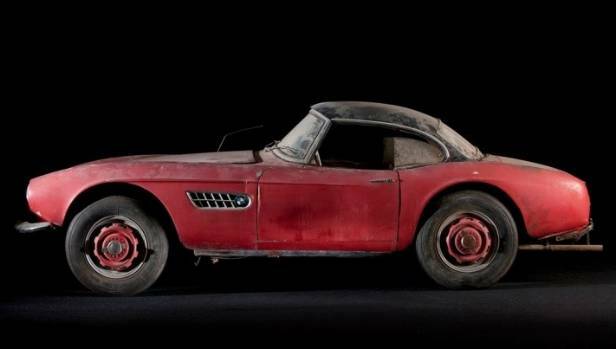 This dilapidated 1957 BMW 507 was once owned by the King of Rock ‘n’ Roll, Elvis Presley. Already famous, and serving a two-year stint in the US Army, Presley was stationed in Germany when he witnessed hillclimb champion Hans Stuck race a 507 at the Autodrome de Linas-Montlhéry in southern France. 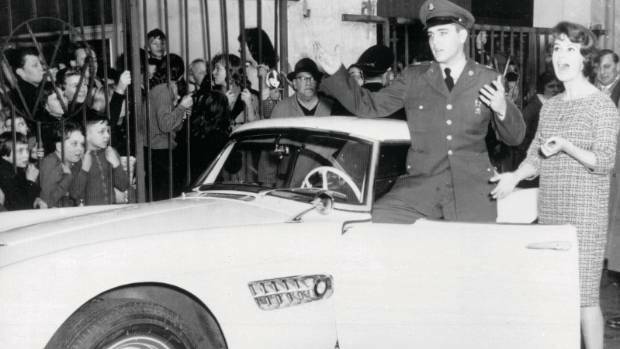 “The King” took possession of that same roadster in December 1958. The car was originally painted Feather white but it quickly became covered in kisses, phone numbers and messages – often written in red lipstick. Presley had it repainted a flashy red to camouflage the marks. The ultimate celebrity automobile, Presley’s 507 was featured in international magazines and even had a role in a minor movie. By 1960 the car made its way to the United States. After passing through several other owners, Jack Castor purchased it in 1968 and kept it for decades. The car was in a bad way when it was rediscovered and even had a Chevrolet V8 engine under the bonnet. But, back in the BMW Group Classic, the car has received a complete restoration over the course of the past two years, with working including repairs to the subframe which had been altered to fit the Chevrolet engine. BMW Group Classic has also built an entirely new V8 for the car. Although there has been suggestions that the car should remain in the “Presley red” colour, the restored BMW 507 roadster is now back to its original Feather white colour. Linda Thompson is well known to Elvis Presley fans around the world as being the woman Elvis chose to date, for a period of years, after Elvis seperated/divorced from Priscilla. But her life story is not limited to being one of the great loves of Elvis (which she was). People email me around the world, to http://www.ElvisCollector.info and http://www.ElvisCollectorWorldwide.freeforums.org, asking why I don’t have photos/videos/blogs/audio/etc. about Lisa Marie and/or Linda Thompson. My answer has been, and will forever be, that Lisa Marie has her own (blessed) memories and she has forums in which to tell her story. Thus it is not my place to interject concerning a father and his daughter. Pertaining to Linda Thompson she also has her own story and forums in which to share and/or tell her story and I trust the judgment, and wisdom, of Linda Thompson. My observations concerning Linda Thompson is that she really loved, and cared for above and beyond, Elvis. She is (including but not limited to); very intelligent, (no disrespect intended) but a beautiful person/woman, quick witted, funny, fashionable, loyal, trustworthy, a successful and talented writer including several beautiful songs such as “my grown up Christmas list” which, in full disclosure, is one of my favorite “contemporary Christmas songs”. Personally she is a wonderful mother and grandmother and she exudes a spiritual (positive) spirit and can (literally) light up a room. Her new book, scheduled to be released in August of 2016 per Amazon, is entitled “A little thing called life”. Her is the direct link for pre-ordering/ordering Linda Thompson book released August 2016. I pre-ordered her book via Amazon and look forward to receiving it, and reading it, and I am thankful that she opted to share aspects of her life with the world. Doing so is a brave and honorable thing. I remember first seeing Linda Thompson back in the 1970’s a couple of times and then (sadly) during Elvis’ funeral with her (if my memory is correct) mother. The first few times I saw her she was immaculately dressed and affectionate/supportive of Elvis publicly and vice versa. But when I saw her at Elvis’ funeral she was (justifiably so)…devastated. Yet she was doing everything she could, with a grace and loving heart, to comfort Lisa Marie and Vernon Presley (who was beyond crushed and it was very moving/touching to see how many friends/family members/co-workers/relatives/etc. were doing everything they could for Vernon. But, his sorrow went to his marrow). His heart. His soul. He loved his son and I don’t know how he was able to get through Elvis’ funeral and the months afterward until he (sadly) died. Interestingly Linda’s older brother, Sam Thompson, worked in a security capacity for Elvis from 1972 until 1976 (approximately when Linda Thompson and Elvis ended their relationship). Sam Thompson went on to have a successful career and I wish him continued success in all of his personal and professional endeavors. I have always encouraged Elvis Presley fans to; reach out, support, let them know how much they are respected and appreciated, add their various works to their collection(s), seek out, and acknowledge their lives and their sacrifices (which include the sacrifices of their family/loved ones). These sentiments are, of course, applicable to Linda Thompson. I have always believed that Elvis Presley fans are the most loyal, and diverse, fans in the world. I hope that they, and tens of thousands of others, purchase her book – encourage family/friends to do so – and share their feedback via social media (i.e. Twitter, Facebook, Google+, etc.). 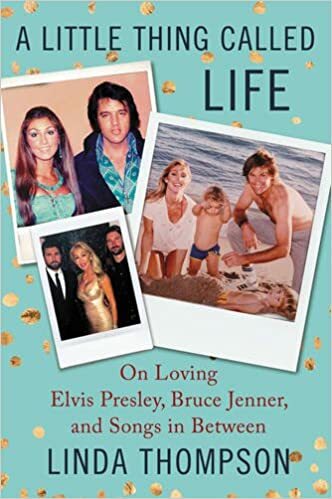 I say this (in part) because Linda Thompson has had a unique life , and is not solely about Elvis but includes aspects about Elvis from her firsthand perspective, and any endeavor she is involved in, in my opinion, is a worthwhile endeavor and should be very interesting. I look forward to reading her book and I am thankful she took the time to write this long awaited book. Take care and may God bless you and yours…always. Scotty Moore playing his guitar with Elvis Presley in middle and Bill Black far right onstage at the Louisiana Hayride. And to those who don’t realize it YES the world had color back then and it was bold, unique, cool, and beautiful. Scott Moored, Elvis Presley’s original guitarist and first manager, passed away on June 2016 in Nashville Tennessee at the age of 84. Our thoughts, and eternal prayers, go out to the loved ones/relatives/friends/etc. of Scotty Moore. There is a case to be made that had it not of been for Scotty Moore Elvis would never have put together the song that launched his career (i.e. That’s all right little momma”) and the signing at Sun Records by Sam Phillips. The story goes that Sam Phillips called Scotty Moore, who was a local musician that was in a group with Bill Black, and wanted him to come to Sun Studio and jam with Elvis Presley to try out some songs. The first time together was nothing special and Sam asked Sonny what he thought which prompted Sam to schedule another jam session and in that session music, entertainment, and the world would forever change. It is a slight to just call Scotty Moore Elvis guitarist as he had a career before meeting Elvis and one afterward. However, he is well known as Elvis’ guitarist. Elvs was fortunate to surround himself with people of quality and that was certainly true of the multi-talented Scotty Moore. I am very sad to learn of the death of Scotty Moore who I have respected all of my adult life. I had met him on two occasions and I am thankful for that honor. ** I implore Elvis Presley fans worldwide to (now) reach out, support. share on social media, collect, etc. those who Elvis Presley was related to and/or worked with for decades. They are, including but not limited to, ; Marty Lacker, Sonny West, Red West, Billy Jo Smith, Joe Esposito, and Jerry Schilling. Additionally there are many fans, friends, and outstanding authors about Elvis that we highly recommend such as; Alanna Nash, Sandi Pichon, Sandie Kaye Stevens, Russ Howe, Kathy Westmoreland, June Juanico, Anita Wood, Linda Thompson, Sam Thompson, Paul Litcher, Phil Arnold, and Larry Geller. Each of these individuals have their own stories as they were firsthand witnesses to Elvis Presley onstage and off. Sadly, each year so many people of quality pass away. Many pass away without them truly knowing how much they are appreciated, respected, acknowledged, etc. by Elvis fans worldwide. In this day of instant messages, emails, social media, etc. there is no reason why we can’t take the time to reach out – give thanks – pray for – wish the best for – support – etc. Please share this article, this blog, our websites, etc. via social media and, as always, we appreciate your comments. Elvis was known as the “king of rock and roll” a title which he never asked for and on several occasions, in response to fans yelling out or having signs of “you are the king Elvis” his response was “there is but one king and his name is Jesus Christ”. However, there is no doubt that Elvis enjoyed the success and adulation sans titles. Elvis Presley sang ballads just as he sang Gospel and uptempo songs. He put his all into each song, as he was a perfectionist who would literally make himself exhausted (vocally, mentally, and physically) until he got the song “just right”, and as much as his fans loved the rock and roll the girls/women swooned over his ballads. We appreciate you taking the time to visit our blog so please feel free to share this post/blog via social media. Also, please visit http://www.ElvisCollector.info and become a member (100% free) of http://www.ElvisCollectorWorldwide.freeforums.org. Thank you again and please feel free to leave a comment. Take care and may God bless you.